Please welcome AAMBookclub Author Tamara Jackson to Conversations today. Tamara is here to talk about her new release, 265 Point. So, check out the cover and blurb, and get to know Tamara by checking out her interview too! As a motivational health and fitness expert, Tamara Jackson is all too familiar with the emotional, psychological and physical challenges associated with weight loss and developing a healthy lifestyle. Tamara has taken to the Internet to challenge and change alarming statistics. Tamara seeks to motivate, educate and inspire women to reclaim their health and their lives. Having reached the point but later suffered a relapse – this book is for you too. I’ve been where you are and I can help. 265 Point is part biography, part education, part inspiration and motivation. I’ve done my best to assemble the elements necessary for you to succeed. • Why traditional dieting doesn’t work. • How to find and keep your motivation. • The real reason you keep sabotaging yourself. • How to handle unsupportive family and friends. • Practical ways to silence “the voice” that seeks to protect you but really sets you up for failure, every time. • Simple steps you can take now to salvage your future through the power of choice. • How to stop short-circuiting your progress with unrealistic expectations and unhealthy comparisons. • Easy ways to identify better food choices when eating out. • Why exercise alone is not enough to get and keep you fit and fly. • How to reprogram your brain to see the best in you rather than the worst in you. • What really drives your sense of dignity and your self-confidence (hint: it’s not what you think). • How to enjoy your favorite foods without interfering with your goals using my 80/20 plan. ‘265 Point’, interesting title, what does it mean? 265 represents my highest weight. I was slim growing up, but in my mid-twenties I was under a lot of emotional stress and turned to food for comfort. Before I knew it, I ballooned to 265 pounds. I didn’t like what I saw in the mirror but I didn’t know how to change it so I remained at that weight for over 6 years. The Point is a place, but not one you would find on a typical street map. It is a location on the continuum of change where you’ve moved past just thinking about change and wanting to change and are now ready to act. What’s the guiding principle of ’265 Point’? Success is an inside job. In order to achieve the look you desire on the outside, you have to address what is going on in the inside, specifically what’s going on in your head. Everything we do (or don’t do) originates with a thought. 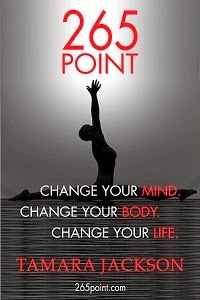 If you just start thinking the right things, you can change your body and ultimately your life. What one or two secrets will people be most surprised to read in the book? The book is chocked full of nuggets, so it’s tough to choose just two. But I think the “Formula for Success” section in chapter 8 will surprise many people. There are millions of people out there that are seriously trying to lose weight and get in shape but haven’t been successful because they have bad or insufficient information. That was one of my biggest problems. I was doing some of the right things but all of my hard work was being cancelled out by a few sabotaging behaviors. I also think that the concept “freedom meals” and an “80/20 rule” in chapter 15 will be a standout for most readers. People are often shocked to hear that I believe there is a place for ice cream, cookies, etc. in our diets, but I have found that demonizing foods always backfires on you. What is the biggest misconception about losing weight? There is a laundry list but I would say the biggest is what I call “magic pill syndrome”. It is the perception that the solution to all of your problems is external – a certain diet, supplement, cleanse, or exercise routine – and when you find it, magically all of your problems are solved. I talk to people all the time who are searching, as if they are a captain on a treasure hunt – if they can just find the golden treasure! They go from one thing to the next – from diet pills to fasts, from fasts to cleanses, from cleanses to Paleo, from Paleo to carb cutting – and the outcome is always the same. There are few things more demoralizing than losing weight, getting compliments from everyone you know on how great you look, and then slowly but surely seeing the weight return…and then some. You’re very transparent in the book. Was that hard for you? I’d be lying if I didn’t admit that it was! What many people don’t realize is that our present is a product of our past. The heartache and pain we experience often gets internalized and turns into emotional baggage that we carry with us everywhere we go. That baggage influences our mindset and results in poor decisions. It was extremely tough to go to cemetery section of my mind and dig up that coffin full of painful memories, but it was important to me to keep it real with this book. I wanted people to be able to see themselves in the pages and finally see what is holding them back. Once you really understand what’s stopping you, massive change is possible. There are tons of weight loss books out there, why should readers choose yours? Well, first let me say ‘265 Point’ is not for everyone. If you’re looking for a roadmap to losing 30 pounds in 30 days, my book is not for you. But if you’re really and truly serious about losing the weight – this time for good – then ‘265 Point” is exactly what you’ve been looking for. I am a certified fitness professional but I’m not some out of touch trainer that just tells you to eat right and exercise. If it were that simple, we wouldn’t have a health crisis in this country! You should choose ‘265 Point’ because it’s written by a person who’s been where you are, understands your pain, and knows the way out. ‘265 Point’ is the blueprint that will get you from where you are to where you want to be – you just have to take the first step. Now that you have penned your first book, what’s next for you? Do you plan to keep writing? Absolutely! I have more books in me and I write almost daily. A lot of my writing ends up in my blog at www.265point.com or in my newsletters, motivational texts, and social media posts. I have found that constant reinforcement of the right thoughts is key to keeping my clients “on point”. I plan to write another book in the next year or two, but right now my focus is helping as many people as I can create their own success story using ‘265 Point’ and our Online Fitness Membership Programs. People are often surprised to learn that they can get amazing results just by connecting with me by phone or Skype on a weekly basis. It may seem far-fetched, but the testimonials on my website prove that it works! I also enjoy getting out there and spreading a message of hope at women’s group meetings and conferences. So many people have given up and just need a change in perspective. Once your perspective changes, what you believe is possible changes. And once what you believe is possible changes, you are positioned not just to survive, but to thrive. All of a sudden anything is possible. That is my mission – to convince anyone who will listen that no matter how many times you’ve failed, it IS possible to live your dreams and lead a happier, healthier life. You just have to believe. To purchase Tamara Jackson’s book, ‘265 Point’ or learn more about her online fitness program, visit her website at www.265point.com. Tamara Jackson is a motivational health and fitness expert who has taken to the Internet to change the alarming statistic that four out of five African American women are overweight or obese. All too familiar with the emotional, psychological and physical challenges associated with developing a healthy lifestyle, Tamara seeks to motivate, educate, and inspire women to take the steps necessary to reclaim their health and their lives. Tamara is a Certified Group Exercise Instructor through the American College of Sports Medicine and has authored the book “265Point” to provide “on point” practical guidance to those that are ready to ditch dieting and get fit for good. She is convinced that that anyone can change with the appropriate tools, systems, and support. Tamara appeared on the demonstration floor of The Dr. Oz show with fitness guru and Insanity® creator Shaun T. in February of 2012. Her weight loss success story is currently being showcased in the top-selling Hip Hop Abs® infomercial. When not writing, coaching, working out or leading a class, Tamara can be found hanging out with family and friends, volunteering, or cuddled up with a book. She’s also a huge fan of roller coasters, whitewater rafting and zip lining. A banking professional of 15 years, Tamara holds a Bachelor’s Degree in Finance from Virginia Tech and a Master’s Degree from the University of Florida.